If there is one place bird-watchers must definitely visit, it is the Nata Lodge close to the well-known Nata Sanctuary in Botswana. Nata Lodge is right on the edge of the Makgadikgadi Salt Pans – the largest salt pans in the world and the remains of Africa’s largest inland sea. 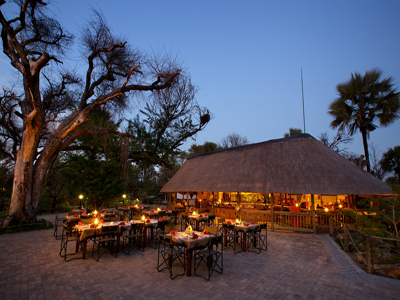 The Lodge is located among Mokolwane palms on the edge of the Makgadikgadi Pans. GPS: 20 13 53.06S, 26 15 90.73E Address: PO Box 10, Nata, Botswana. The Nata Lodge offers three accommodation options: chalets, family chalets and safari tents. Eight en suite chalets are built on a platform overlooking the Didibakwe river and in the shade of Ilala palm trees. Two of these chalets have outdoor showers and Victorian ball-and-claw baths (ask for the Luxury chalets). 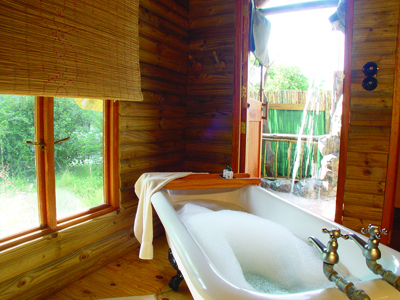 On the southern boundary of Nata Lodge, there are 12 A-frame chalets, each with a stone verandah and semi-open bathroom. All the chalets offer ceiling fans and a safe to lock away your valuables. The meru-style custom-built tents of the Nata Lodge are unique. Ten tents (all with en suite bathrooms) are pitched on wooden platforms in the shade of Marula trees. The campsite makes for an unforgettable stay below African skies. Ablution facilities are well-kept and offer semi-open showers with hot and cold water. Please note that the campsite does not have electricity points. The Nata River forms a delta which feeds Sanctuary’s Sua Pan. 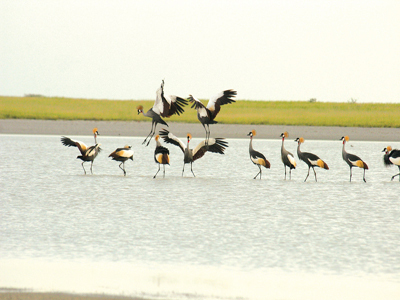 This is the breeding ground for huge numbers of water birds such as flamingos and pelicans. A guided tour in one of the Nata Lodge’s open vehicles into the Sanctuary is not to be missed. Almost 165 bird species have been recorded in the Sanctuary. The Nata Lodge is surrounded by many trees and these are home to many birds of different species. A water feature and bird feeding area ensure that there are always birds and bird antics to watch. Among the species that are found at Nata Lodge, is Paradise Wydah, Crested Francolin, Meyers Parrot etc. At night, the nocturnal birds supply the entertainment. Nata Lodge offers a fine restaurant with a la carte menu, while guests can enjoy a braai buffet in the boma on Saturday evenings. As previously mentioned Francistown, Botswana second largest city is 200 km south of Nata Lodge. The Thapama Hotel is the most luxurious hotel and the Marang Gardens Hotel in the same city offers excellent value for money. If you wants to visit Chobe National Park and Kasane after your visit to Nata Lodge consider the Mowana Safari Lodge on the banks of the Chobe River 300 km to the North. 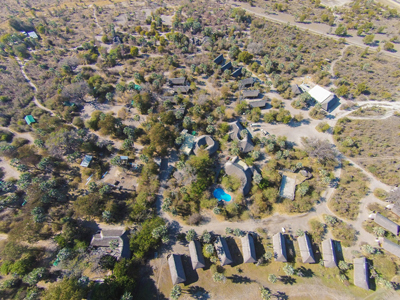 In The West of the country and 500 km from Nata Lodge is two lodges which we recommends namely Thakadu Camp which is just five km from Ghanzi in Botswana. 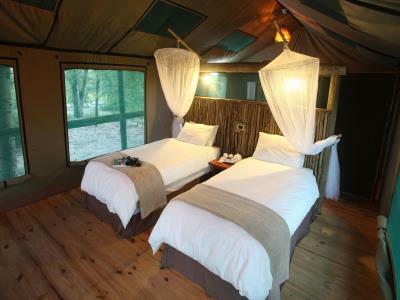 Thakadu Camp is on a private game reserve and it offers en-suite accommodation in chalets and meru tents. If you prefer more luxury accommodation consider Kalahari Arms Hotel which is the most luxurious hotel in at the gateway to the Central Kalahari Game Reserve. The nearest airport to Nata Lodge is at Francistown or Kasane or Maun. All more than 200 km away. If you want to include Nata Lodge as part of a 4x4 trip you will need to hire a fully equipped 4x4 vehicle. Johannesburg 4x4 Hire provide excellent Landcruisers not only in South Africa but also in Botswana. Allow two days to drive from Nata Lodge to Swakopmund in Namibia. Perhaps a good place for an overnight stop will be one of above mentioned lodges. In Swakopmund Nata Lodge believe that Alte Brucke self-catering (self-contained) accommodation near the beach will be your answer. 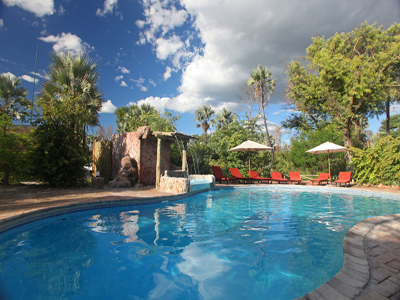 If you decided to visit Etosha National Park try Etosha Lodge just south of the Etosha National Park. Sossusvlei Lodge at Sesriem is an upmarket and luxury lodge more than a 1000 km from Nata. There are also some fine Swakopmund Hotels. From Nata Lodge you can continue along the main road and then cross the border at Pandamatenga into Zimbabwe. This will mean that you are in a wilderness area within two hours after you left Nata. From Pandamatenga it will take you 2 hours to reach Victoria Falls where A'Zambezi River Lodge is the only hotel on the banks of the Zambezi River a few km upstream from the water fall. If you plan a visit to Harare the capital city consider The Rainbow Towers Hotel which was previously known as the Sheraton Hotel Harare. In South Africa there are numerous lodges which can compare with Nata Lodge both in terms of value for money and luxury. Bains Game Lodge is a small game farm in Bloemfontein and the Misty Mountain Lodge in the Misty Mountain Reserve in the Tsitsikamma district of South Africa is of the same standard while Merino Inn Hotel in Colesberg is the only hotel in the Northern Cape Town. Kalahari Arms Hotel Etosha Lodge Bains Game Lodge.